Mr. President and the development team talked about IC-7800. To measure the IP3, ICOM uses the very best measurement tools, such as a high purity signal generator. ICOM carefully used two signal generators not to get them mutually interfered. To achieve +40dBm IP3, ICOM has changed the AGC loop structure. To boost the dynamic range, IC-7800 has an independent AGC loop in front of the IF filter. With this configuration, the AGC loop behind of the IF filter is not affected by the delay of the filter. In addition, the local oscillator runs at very high level, about 30Vp-p.
IC-7800 does not employ the roofing filter of over-tone type, which has high impedance and therefore is likely to have distortion. It uses the crystal filter of fundamental type. 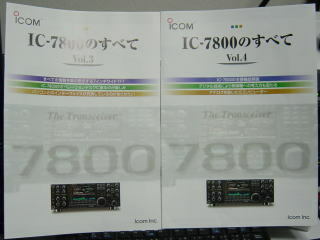 Many users had been asking ICOM when the successor of IC-780 comes out. For this reason, IC-7800 intentionally takes over the front panel design of IC-780 (JA version of IC-781). The operation scheme of IC-7800 is a bit different from that of IC-780. For example, two or more functions are assigned to one button. Timing critical operation is assigned to "one push, " while not timing critical operation is assigned to "push&hold." IC-7800 has two kinds of notch filters, that is, manual and automatic notch filters. The manual notch filter has three user-selectable Q options, which are suited for SSB and CW operations. The design team is unwilling to discard the conventional analog meter. IC-7800 emulates it by using LCD color dots. IC-7800 uses four DSP chips, one for TX, two for RX, and the other one for the band scope. All are TI's. The former three chips are exactly the same chip, but the last one for the band scope is different. Just plugging in the USB keyboard to IC-7800 enables the RTTY and PSK31 operation, as IC-7800 has the modulator and demodulator built in. The user can transmit the messages stored in the CF memory card. The received messages can also be stored in the CF memory card. IC-7800 has two fully independent receivers. The audio output signals of the receivers are composed into the internal speaker. However, these two audio output signals can separately be transferred to external speakers. The AF range of the TX audio can be adjusted by the user. The lower limits are 100, 200, and 300Hz. The upper limits are 2000, 2800, and 2900Hz. Thanks to the progress in semiconductor technologies, digital devices, such as DSP and A/D D/A converters, have been improved in the performance. In the development phase of IC-756PRO, which was five years back, we had to use an A/D converter that dissipated much current and required 10 seconds for the calibration. The 24-bit A/D converter in IC-7800 is much easier to use. The dynamic range of the analog input to the A/D converter is about 120dB. Theoretically, 24 bits, on the other hand, is capable of 144dB. This particular design point is similar to the IC-756PRO, but IC-7800 employs far different design approach in front of the IF stage. In northern Europe, the number of BC stations has been increasing a lot. The IC-7800 development team notices that the terminal of the LW antenna for the BC band is excited as high as 0dBm there. They are not quite sure this is also true in North America. A development team member says ICOM is redesigning the LCD display layout and color. This may or may not be one of reasons that put off the start of delivery. The members of the IC-7800 development team are almost the same as those of IC-756PRO, which ICOM developed four years ago. IC-7800 is equipped with a LAN port, which could be used by varisous applications. ICOM would like to exploit good applications in cooperation with the users, as users' requests vary widely. It is a good idea to offer a development environment for users who make applications by themselves. The audio output levels for the internal speaker and the external headphone can independently be adjusted. The TX equalizer amplifier is the same as IC-756PRO's. The basic idea to the IF filter is that it should be as flat as possible. ICOM has had the conception of transceivers that would replace IC-781 for several years, but started the practical development of IC-7800 two and half years ago. One of the most challenging barriers in the development is to reduce the noise generated within the transceiver. Many qualified devices are used in IC-7800. The total number of parts exceeds 10,000. This is twice as large as that of IC-756. It was often said that the ICOM transceivers had unique TX audio. This is mainly due to the crystal filter characteristics. That's why the TX audio has been changed in IC-756PRO and later released rigs. The input voltage specification is pretty wide, 85 to 265V, which should accommodate the world wide operation. IC-7800 uses more than 100 mechanical relays on behalf of switching diodes, which occasionally induce distortion. Fortunately, small but good relays have recently been available. 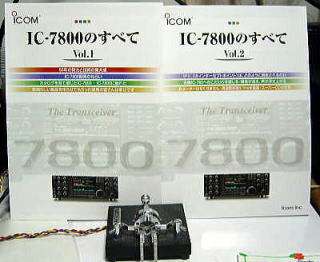 IC-781 was in the ICOM product line for 15 years. IC-7800 will be lasting 20 years. IC-7800 uses Real Time OS (RTOS), which is rewriteable by capable programmers. The layout of the main LCD display could be modified. It is not an easy job to investigate, test, implement and use devices. ICOM has made a team dedicated to device research. When measuring the devices with instruments, the team sometimes gets confused if they are measuring the device or the instrument. In such a case, they connect a real antenna, listen to the signals, and make decisions. There is a wide variety of requirements for the user interface. ICOM would not be able to accommodate all the requirements, but they want to give solutions to as many of them as possible. ICOM would like to offer customizing services through the network, as wireless LAN and satellite TV have already offered such services.